We investigated the properties of leishmania exosomes with respect to influencing innate and adaptive immune responses. Exosomes from Leishmania donovani modulated human monocyte cytokine responses to IFN-γ in a bimodal fashion by promoting IL-10 production and inhibiting that of TNF-α. Moreover, these vesicles were inhibitory with respect to cytokine responses (IL-12p70, TNF-α, and IL-10) by human monocyte-derived dendritic cells. Exosomes from wild-type (WT) L. donovani failed to prime monocyte-derived dendritic cells to drive the differentiation of naive CD4 T cells into IFN-γ–producing Th1 cells. In contrast, vesicles from heat shock protein (HSP)100−/− L. donovani showed a gain-of-function and proinflammatory phenotype and promoted the differentiation of naive CD4 lymphocytes into Th1 cells. Proteomic analysis showed that exosomes from WT and HSP100−/− leishmania had distinct protein cargo, suggesting that packaging of proteins into exosomes is dependent in part on HSP100. Treatment of C57BL/6 mice with WT L. donovani exosomes prior to challenge with WT organisms exacerbated infection and promoted IL-10 production in the spleen. In contrast, HSP100−/− exosomes promoted spleen cell production of IFN-γ and did not adversely affect hepatic parasite burdens. Furthermore, the proparasitic properties of WT exosomes were not species specific because BALB/c mice exposed to Leishmania major exosomes showed increased Th2 polarization and exacerbation of disease in response to infection with L. major. These findings demonstrate that leishmania exosomes are predominantly immunosuppressive. Moreover, to our knowledge, this is the first evidence to suggest that changes in the protein cargo of exosomes may influence the impact of these vesicles on myeloid cell function. Leishmania donovani is the causative agent of Old World visceral leishmaniasis (VL), a disease characterized by hepatosplenomegaly, fever, and weight loss. A variety of treatment regimens have been described for VL, and although these can be highly effective, they represent a significant expense in the developing world. Moreover, responses can be variable and drug resistance is a significant challenge in endemic foci (1, 2). In the absence of effective chemotherapy, substantial morbidity and mortality ensue. A more comprehensive understanding of the biology of leishmania-host interactions would assist in the design of more effective therapeutics and a long sought vaccine strategy. Thus far, no leishmania vaccines have received regulatory approval, although scarification with live, attenuated organisms has been used in several endemic regions and has been linked anecdotally with protection against homologous infection (1). It is widely appreciated that leishmania secrete bioactive compounds that are involved in pathogenesis (3). For example, the surface metallopeptidase GP63, known to be necessary for virulence in mice (4, 5), was recently shown to directly inhibit MAPK signaling in host cells (6), presumably after secretion into the host cytoplasm. In addition, leishmania secrete cysteine peptidases like cathepsins B and L, which have been shown to play a role in virulence through activation of TGF-β (7, 8). Work from this laboratory has demonstrated that leishmania secrete elongation factor-1α (EF-1α) into host cytosol where it selectively activates the Src homology region 2 domain-containing phosphatase-1 in host cells, leading to inhibition of IFN-γ signaling and prevention of macrophage activation (9). Indeed, a hallmark of leishmaniasis is persistent infection of macrophages, which display a deactivated phenotype (10–12). Despite the obvious interest in and attention paid to leishmania-secreted molecules, the mechanism(s) of release of leishmania effector proteins into host cells was, until recently, unknown. We have lately identified a general mechanism for protein export by leishmania, based on the secretion of exosomes, and showed that exosomes are involved in the delivery of proteins into host target cells (13). Exosomes are 30- to 100-nm microvesicles, formed by invagination of endosomal membranes leading to the formation of multivesicular bodies. These microvesicles then released into extracellular spaces upon fusion of multivesicular bodies with the plasma membrane (14). Multiple mammalian cell types have been shown to release exosomes including dendritic cells (DCs), macrophages, T and B cells, and a wide variety of tumor cells (15). These microvesicles have been shown to function in cell-to-cell communication via receptor-mediated activation of signaling pathways, in Ag presentation, and in the delivery of surface receptors and exosomal shuttle RNA to recipient cells (14). In this paper, we examined the immunomodulatory properties of leishmania exosomes. Our findings show that these organelles are generally immunosuppressive and that their effects on myeloid cells are influenced by their protein cargo. To the best of our knowledge, this is the first description of a mechanism for delivery of leishmania-immunosuppressive molecules to host cells as well as the first description of immunomodulatory exosomes secreted by nonmammalian cells. Except where otherwise noted, reagents were obtained from the Sigma-Aldrich (St. Louis, MO). PBS and RPMI 1640 were purchased from StemCell Technologies (Vancouver, British Columbia, Canada). FBS (Life Technologies, Rockville, MD) was purchased from Invitrogen (Carlsbad, CA). All ultracentrifugation hardware including tubes, rotors, and centrifuges were purchased from Beckman Coulter (Fullerton, CA). Generation of heat shock protein (HSP)100 and lipophosphoglycan (LPG)2 null mutant L. donovani was described previously (16, 17). L. donovani Bob and BobLPG2−/− were a gift from Dr. S. Beverley (Washington University, St. Louis, MO). All leishmania parasites (L. donovani Sudan S2, 1SR, 1SR HSP100−/−, Bob, BobLPG2−/−, and Leishmania major Fredlin [MHOM/IL/80/Friedlin]) were cultured in medium 199 plus 10% FBS as reported previously (18). Axenic amastigotes were generated as we have done previously (19). To maintain virulence, L. donovani 1SR, 1SR HSP100−/−, and L. major strains were passaged in BALB/c or C57BL/6 mice as reported previously (19). Peripheral blood was obtained from healthy volunteers following approval by the University of British Columbia Clinical Research Ethics Board and after obtaining written informed consent. PBMCs were isolated by Ficoll separation. CD14+ monocytes were isolated either by adherence for 1 h, followed by washing or by positive or negative selection (StemCell Technologies). Naive CD4+ T cells were purified by negative selection (StemCell Technologies). The CD4+ T cells demonstrated high expression of CD4 until treatment with PMA/ionomycin, which downregulated CD4 expression by up to 50% (data not shown). Immature DCs were generated by culturing monocytes for 5 d in RPMI 1640 supplemented with 10% FBS, 10 mM HEPES, 2 mM glutamine, 1 mM sodium pyruvate (StemCell Technologies), 1 mM MEM nonessential amino acid solution (StemCell Technologies), 50 mM 2-ME (Bio-Rad, Hercules, CA), and 100 U/ml each of penicillin G and streptomycin with 50 ng/ml recombinant human GM-CSF (StemCell Technologies) and IL-4. DC medium, plus cytokines, was replenished every 2 d. The immature DCs demonstrated a high expression level of CD11c, medium expression level of HLA-DR and CD80, low expression level of CD86, and negative expression level for CD83 (data not shown). Endotoxin-free exosomes were harvested exactly as described previously (13). Briefly, cells were washed and resuspended in RPMI 1640 supplemented with 10 mM HEPES, 2–4 μM MES (to bring the pH down slowly to 5.5), 2 mM l-glutamine, 0.2% d-glucose, and 100 U/ml each of penicillin G and streptomycin. Exosomes were collected for 24 h and then isolated using all culture grade solutions. After removal of cells by low-speed centrifugation and debris by filtration through a 0.2-μm Stericup vacuum filter unit (Millipore, Bedford, MA), vesicles were concentrated using 100,000 kDa Molecular Weight Cut-Off VivaCell 100 filtration devices (Sartorius, Edgewood, NY) from 400 to 0.5–0.2 ml. This was layered on top of a 1 M sucrose cushion (13) that had been cleared of endotoxin by filtration through Mustange E endotoxin removal filters (Pall, Mississauga, Ontario, Canada). Beckman Ultraclear 5-ml tubes were incubated with 30% H2O2 for 4 h to remove endotoxin, followed by extensive washing with water. Two milliliters of PBS was underlayed with 0.75 ml 1 M sucrose, and concentrated samples were then overlayed. After ultracentrifugation, the exosome fractions were collected from the top. After resuspension in 15 ml PBS, sucrose was removed by concentration to ≈200 μl with 100,000 kDa Molecular Weight Cut-Off Vivaspin 20 filtration devices (Sartorius). Twenty microliters of 1 M sucrose was added to exosomes prior to storage at −80°C. Exosome isolation for quantitative tandem mass spectrometry, sucrose gradient analysis, and Western blotting was conducted exactly as described previously (13). Endotoxin-free exosomes collected from leishmania at 37°C and pH 5.5 were incubated with monocytes (100,000 cell/well) in 96-well plates. In parallel, cells were treated with 1 μg/ml Escherichia coli 0111:B4 LPS, 1 ng/ml recombinant human IFN-γ (BioSource International, Camarillo, CA), and L. donovani at a multiplicity of infection of 10:1 as positive controls. For some experiments, after 2–12 h of exosome treatment, 2 ng/ml recombinant human IFN-γ was added to the wells for 24 h. After 5 d of differentiation, DCs were collected and plated (100,000–200,000 cells/well) in 96-well plates and treated with exosomes. 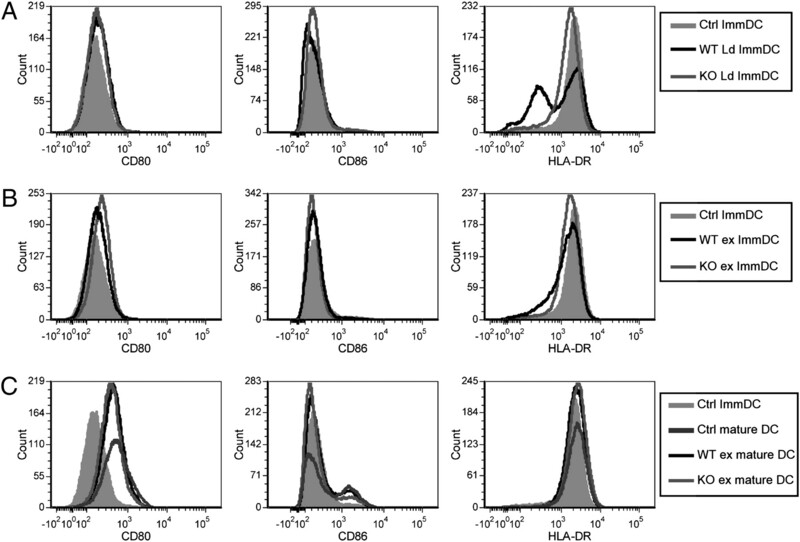 After 12–15 h, DCs were matured by transfer onto wells containing irradiated CD40L-expressing fibroblasts (20) at a ratio of 1:4 and incubated for 24 h (T cell coculture) or 48 h. The mature DCs showed a high expression level of CD11c, HLA-DR, CD80, and CD86 and moderate expression level of CD83 (data not shown). For experiments with DCs alone, supernatants were collected after 48 h and stored at −80°C, and cells were processed for flow cytometric analysis. In some cases, 24 h after DC maturation, immature and mature DC cell-free supernatants were removed, leaving DCs behind, and cells were resuspended in fresh medium containing naive CD4+ T cells at a DC/T cell ratio of 1:5. After 5 d, supernatants were collected and stored at −80°C, and cells were processed for flow cytometric analysis. BALB/c and C57BL/6 mice were purchased from and housed in the University of British Columbia Animal Facility at Jack Bell Research Center following University of British Columbia animal welfare guidelines. Five-month-old C57BL/6 mice received hind leg s.c. injections of 200 μl consisting of 10 mM Tris/0.25 M sucrose containing 15 μg L. donovani 1SR exosomes, either wild-type (WT) or HSP100−/−. Some mice were left unvaccinated or vaccinated with only Tris buffer. After 2 wk, mice were boosted with the same immunization regimen. Three weeks after this boost, mice were injected i.v. via the tail vein with 106 stationary-phase WT L. donovani 1SR, which had been recently recovered from the spleens of infected mice. Mice were monitored weekly for signs of illness and 1 mo following infection were anesthetized with CO2 and sacrificed by cervical dislocation. Spleens were harvested, and single-cell suspensions were generated following previously described protocols (21) for further analysis of parasite load and immune phenotype. Five-week-old BALB/c mice received s.c. injections in the right hind leg of 50 μl PBS containing 15 μg L. major exosomes or not. After 2 wk, this was repeated. After an additional 3 wk, mice were challenged s.c. with L. major. Lesion size, length, and width were recorded weekly. After 5 wk, mice were euthanized, and the spleen, draining lymph nodes, and lesional tissue were harvested. After generation of single-cell suspensions, some cells were lysed, and mRNA was collected using the total RNA isolation kit (Promega, Madison, WI) following the manufacturer’s recommendations. Remaining cells were processed for flow cytometric analysis. Spleen parasitic loads were determined by limiting dilution assay as described elsewhere (22). Briefly, organs were collected, weighed, and homogenized individually in 2 ml HBSS. The homogenized organ suspensions were pelleted (5 min at 4000 rpm) and resuspended in 300 μl M199 medium supplemented with 10% FCS. Two hundred microliters of suspension was placed into the first well, and 4-fold serial dilutions were distributed in the 96-well plates. Plates were examined after 21 d at 26°C. Parasite loads were expressed as the number of Leishmania per gram of homogenized spleen. After exosome treatment and 48 h of maturation or not, DCs were stained for cell surface markers CD11c (BD Pharmingen, San Diego, CA), HLA-DR (BD Pharmingen), CD80 (BD Pharmingen), CD86 (BD Pharmingen), and/or latent activating peptide of TGF-β (BD Pharmingen). Samples were acquired on a BD FACSCanto and analyzed with FCS Express Pro Software, version 3 (De Novo Software, Thornhill, Ontario, Canada). For analysis of intracellular cytokine production, both human and mouse T cells were activated with 10 ng/ml PMA and 500 ng/ml Ca2+ ionophore for 6 h. Brefeldin A (10 μg/ml; Sigma-Aldrich) was added halfway through activation. Staining for cell surface markers CD4 (eBioscience, San Diego, CA), CD11c (BD Pharmingen), and CD25 (BD Pharmingen) was carried out prior to intracellular staining. Following surface staining, cells were fixed in 2% formaldehyde and permeabilized with 0.5% saponin. For analysis of Foxp3 expression, cells were resuspended in ice-cold 2× Foxp3-specific Fix/Perm buffer (eBioscience). Intracellular cytokine staining was performed with Abs against IFN-γ (BD Pharmingen), IL-2 (BD Pharmingen), IL-4 (BD Pharmingen), IL-10 (BD Pharmingen), Foxp3 (eBioscience), and/or IL-17 (eBioscience or R&D Systems, Minneapolis, MN). Samples were acquired and analyzed as stated above. Splenocytes were plated in 96-well round-bottom plates at 250,000 cells/well and either treated with 10 μg/ml soluble leishmania Ag (SLA) or not. In parallel as a positive control, wells were coated with 10 μg/ml anti-CD3 (BD Pharmingen) overnight prior to addition of splenocytes. To generate SLA, stationary-phase L. donovani 1SR was washed in HBSS, resuspended in PBS at 108 parasites/ml, and subjected to repeated freeze-thaw (23). Insoluble material was removed by centrifugation (700 × g for 1 min), and the SLA was stored at −80°C. Protein concentration of SLA was determined by Micro BCA Protein Assay Kit (Pierce, Rockford, IL). Supernatants were collected after 48 h of treatment for cytokine analysis. ELISA was used to determine the concentrations of TNF-α (eBioscience), IL-6 (BD Pharmingen), IL-12p70 (eBioscience), IL-10 (BD Pharmingen), IFN-γ (eBioscience), IL-4 (eBioscience), and/or IL-8 (BD Pharmingen) in supernatants of monocytes, DCs, and DC-T cell cocultures, following the manufacturers’ protocols. In some cases, supernatants were analyzed with a Human Inflammatory Cytokine Cytometric Bead Array Kit (BD Pharmingen) following the manufacturer’s instructions. A Mouse Th1/Th2/Th17 CBA Kit (BD Pharmingen) was used to assess cytokine secretion by splenocytes isolated from exosome-vaccinated C57BL/6 mice following the manufacturer’s protocol. Leishmania, ≈1 × 109, were collected (10 min, 690 × g, 4°C) and washed twice with PBS [137 mM NaCl, 8 mM Na2HPO4, 2.7 mM KCl, and 1.5 mM KH2PO4 (pH 7.0 or 5.5)]. Following resuspension in 50 μl 40 mM Tris (pH 9.5) supplemented with protease inhibitors (1 mM EDTA, 1 mM phenanthroline, and 0.01 mM E-64), cells were subjected to five freeze-thaw cycles using solid CO2/ethanol. The lysate was then subjected to clearance by centrifugation (30 min, 20,000 × g, 4°C). The supernatant was transferred to ultracentrifuge tubes, and microvesicles were pelleted by centrifugation at >200,000 × g (60 min, 4°C, Beckman Optima TL-100, TLS-55 rotor). The sediment was resuspended in 50 μl PBS, and 150 μl rehydration buffer (8 M urea, 2 M thiourea, 4% CHAPS, and 2.4% aminosulfobetaine-14) was added. Two-dimensional protein electrophoresis was performed essentially as described previously (24). Spots were identified in three independent sets of two-dimensional-PA gels as overrepresented in the pellet of WT L. donovani versus HSP100−/− mutants. Only consistently overrepresented spots were further analyzed. The proteins in the gel plugs were destained, digested with trypsin (Promega), extracted, purified on a C18 reverse-phase matrix, and eluted in 8 μl 60% acetonitrile and 0.1% trifluor-acetic acid (24). A total of 2.5 μl of the eluted peptides were spotted onto a 378-well, 400-μm Anchor Plate (Bruker Daltonics, Bremen Germany). When the solvent was almost evaporated, 1 μl matrix solution (saturated α-cyano-4-hydroxy-cinnamic acid solution in 50% acetonitrile and 0.1% trifluor acetic acid) was added. The plate was air-dried. MALDI-TOF mass spectrometry was performed on a Bruker Autoflex Mass Spectrometer (Bruker Daltonics). Measurements were performed in the reflection mode using the following settings: ion source 1 voltage, 19 kV; ion source 2 voltage, 16.5 kV; reflector voltage, 20 kV; lens voltage, 8 kV; 40-ns pulse time; 120-ns pulse extraction time; and matrix suppression <500 Da. Spectra were analyzed using the XTOF analysis software package, version 5.1.5 (Bruker Daltonics). The mass spectra were calibrated internally, using a mix of four peptides (Sigma-Aldrich). Monoisotopic masses generated by MALDI-TOF mass spectrometry were searched against peptide masses of eukaryotes in the Matrix Science Data Base 20060831 using the MASCOT program (http://www.matrixscience.com). One missed cleavage per peptide and a mass tolerance of 80 parts per million were allowed. Carbamidomethylation of cysteine residues was set as a fixed modification. Quantitative tandem mass spectrometry of WT versus HSP100−/− exosomes was conducted exactly as described previously (13). Briefly, tryptic peptide digests were desalted and concentrated as described previously (25), and reductive dimethylation using formaldehyde isotopologues was performed to differentially label peptides from different growth conditions. Peptides from WT exosomes were labeled with light formaldehyde (CH2O), whereas peptides from HSP100−/− were labeled with heavy formaldehyde (C2H2O). The labeling reactions were performed as previously described (26), and combined peptide samples were analyzed by liquid chromatography-tandem mass spectrometry with a linear trapping quadrupole-Orbitrap (LTQ-OrbitrapXL; ThermoFisher Scientific, Bremen, Germany) (25). Fragment spectra were searched against the L. major (May 2006 compilation, 17,392 sequences) protein database using Mascot (version 2.2; Matrix Science) with the following parameters: trypsin specificity allowing up to one missed cleavage, cysteine carbamidomethylation as a fixed modification and heavy and light dimethylated lysine side chains and peptide N termini, methionine oxidation and deamidation of asparagine and glutamine as variable modifications, electrospray ionization-trap fragmentation characteristics, 3 parts per million mass tolerance for precursor ion masses, and 0.8-Da tolerance for fragment ion masses. As we have published previously (18), proteins were considered identified when at least two unique peptides of eight or more amino acids and with Mascot IonsScores >25 resulting in an estimated false discovery rate of <0.5%, based on reversed database searching. All peptide and protein identification information acquired in this study can be found in Supplemental Tables I and II. mRNA detection for the cytokines IL-10 and IL-12(p40), as well as a housekeeping gene GAPDH, were performed using a semiquantitative RT-PCR method previously described (23), with minor modifications. Briefly, 100 ng RNA was treated with DNAse (Fermentas, Burlington, Ontario, Canada) for 30 min, and the DNAse was subsequently inactivated for 10 min at 65°C. First-strand DNA was synthesized using SuperScript II Reverse Transcriptase (Invitrogen). Gene amplification was conducted in a semiquantitative PCR with GoTaq Green Master Mix (Promega). Samples were incubated for 3 min at 94°C and were then amplified with an experimentally determined annealing/polymerizing cycle (94°C for 0.5 min, 60°C for 0.5 min, and 72°C for 0.75 min). Thirty-two cycles were used for IL-10, IL-12, and GAPDH. PCR products were separated in 2% agarose gel, and images were obtained with a GelDoc Scanning System. The signals were analyzed using Un-Scan-it software (Silk Scientific, Orem, UT). The primers and probes used for amplification and detection were as follows: IL-10, 5′-AGAAGCATGGCCCAGAAATCA-3′ (forward) and 5′-GGCCTTGTAGACACCTTGGT-3′ (reverse); IL-12, 5′-TGGTTTGCCATCGTTTTGCTG-3′ (forward) and 5′-ACAGGTGAGGTTCACTGTTTCT-3′ (reverse); and GAPDH, 5′-TGACCACAGTCCATGCCATC-3′ (forward) and 5′-GACGGACACATTGGGGGTAG-3′ (reverse). Data was analyzed with GraphPad Prizm, version 5. In some cases, because of wide variations between human donors, the experimental values were normalized to the control value for each donor, and this was followed by log transformation of all the data points. To determine statistically significant differences paired, a two-tailed Student t test was used for experiments with human cells, whereas an unpaired, two-tailed Student t test was used in the mouse experiments. All error bars represent SEM. Having established that leishmania promastigotes secrete exosomes (13) and that exosome release is increased by conditions mimicking early infection, we hypothesized that early in infection leishmania exosomes function to prime cells in the local environment for infection. To test this hypothesis, we examined the effect of leishmania exosomes on IFN-γ–induced cytokine production by naive and infected monocytes. Preincubation of monocytes with exosomes did not affect their subsequent cytokine production in response to IFN-γ (Fig. 1). In contrast, when cells were pretreated with exosomes before infection with leishmania, significant inhibition of IL-8 and TNF-α production in response to IFN-γ was observed (Fig. 1A, 1B). 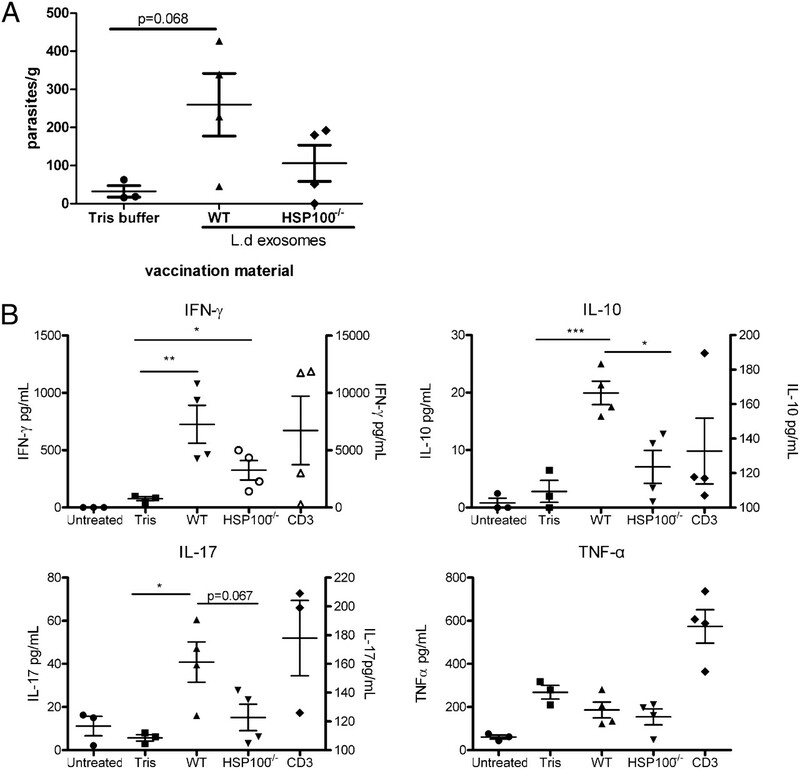 Rather than inhibition, exposure of monocytes to exosomes prior to infection significantly potentiated IFN-γ–induced IL-10 production (Fig. 1C). Notably, IL-12p70 was not reliably detected in supernatants of human monocytes, even following LPS stimulation. These findings suggest that, with the exception of directly promoting IL-8 secretion, leishmania exosomes may have a generally immunosuppressive effect on human monocytes. Pretreatment with leishmania exosomes inhibits IFN-γ induction of cytokines in leishmania-infected human monocytes. Monocytes were treated with 2 μg/ml endotoxin-free exosomes collected from L. donovani Sudan S2 for 2 h prior to infection. Infection with L. donovani Sudan S2 proceeded for 12 h, at which point cells were treated with 2 ng/ml IFN-γ for 24 h. LPS treatment was initiated at the same time as infection. Supernatants were analyzed by ELISA for IL-8 (A), TNF-α (B), and IL-10 (C). Fold differences were calculated in relation to the untreated value for each of three individual donors tested. Following this all values were log transformed. Each data point represents the mean of triplicate wells in an ELISA. *p ≤ 0.05; **p ≤ 0.01. Monocyte-derived DCs (MoDCs) found at the site of L. major infection have recently been shown to control the induction of a functional Th1 response in mice (27). In light of this finding and also their multiple other roles in the adaptive immune response, we investigated the effects of leishmania exosomes on MoDC phenotype and function. Incubation of immature MoDCs with leishmania exosomes did not alter surface expression of HLA-DR, CD80, or CD86 (data not shown). Moreover, we saw no changes in MoDC surface expression of latent activating peptide of TGF-β in response to exosome treatment (data not show). However, exosome pretreatment modestly but reproducibly reduced surface expression of CD80, CD86, and HLA-DR (Fig. 2A) on MoDCs after CD40L maturation, although no changes in the latent activating peptide were detected (data not shown). Leishmania exosomes modulate the phenotype of immature and mature MoDCs. MoDCs were either infected with L. donovani Sudan S2 or treated overnight with exosomes collected from these leishmania as described in the legend to Fig. 1. Cells were then either matured or not by transfer onto irradiated CD40L-expressing fibroblasts. After 48 h, supernatants were harvested and stored at −80°C. DCs were stained for CD11c, HLA-DR, CD80, and CD86 and analyzed in a BD FACSCanto with gating on CD11c+ cells. A, Leishmania exosomes inhibit HLA-DR expression by mature MoDCs. The histograms from one representative experiment of five are shown on the left. The solid gray areas are untreated immature MoDCs, the black lines represent untreated matured MoDCs, and the dotted lines are mature DCs treated with either 2, 20, or 50 μg/ml leishmania exosomes. The results from all five experiments are shown in the graphs to the right. B–D, Leishmania exosomes inhibit cytokine secretion by immature and mature MoDCs. Supernatants from exosome-treated DCs were analyzed by ELISA for IL-12 (B), TNF-α (C), and IL-10 (D). Fold differences were calculated in relation to the untreated value of either immature or mature conditions from either four (B, C) or six (D) experiments with cells harvested from different donors. * p ≤ 0.05; **p ≤ 0.01; ***p ≤ 0.001. In contrast, the cytokine profile of exosome-treated MoDCs clearly demonstrated significant, dose-dependent inhibitory effects (Fig. 2B–D). Under all conditions, exosomes inhibited MoDC production of IL-12p70 and IL-10. 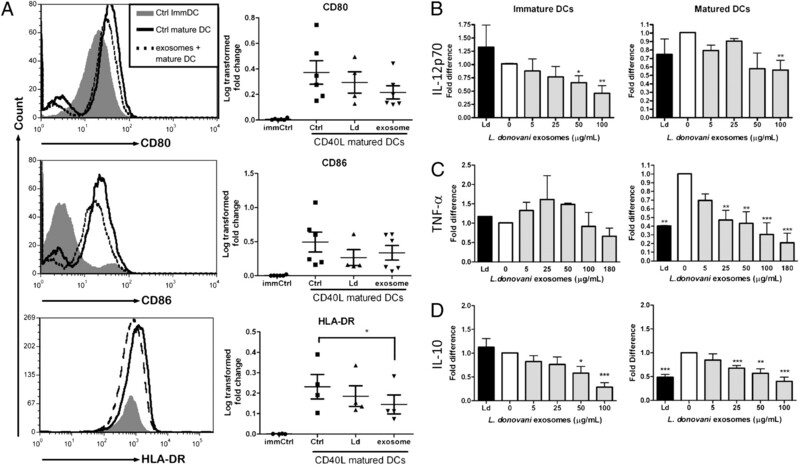 TNF-α production by CD40L-matured DCs was also significantly inhibited by exosomes (Fig. 2C), and immature cells followed a similar pattern. To control for the possibility that exosome treatment was toxic to DCs, cells were incubated with 7-aminoactinomycin D to stain dead cells, and no toxicity was apparent (data not shown). Although expression of maturation markers CD80 and CD86 by DCs was not significantly altered by exosome treatment (Fig. 2A), HLA-DR expression was significantly attenuated, suggesting the possibility that specific DC functional properties might be impaired, as was indicated by our observations of cytokine modulation. To examine this further, MoDCs were pulsed with L. donovani exosomes and then examined for their ability to support the differentiation of Th1 cells. Exosome-pulsed MoDCs were cocultured with naive CD4+ T cells, and after 5 d, the proportion of IFN-γ–producing cells was measured. As a control we measured the development of Th1 cells in response to MoDCs that had been infected with L. donovani rather than treated with exosomes. We found that L. donovani infection of mature MoDCs (as well as immature MoDCs; data not shown) did not significantly influence the frequency of IFN-γ–secreting T cells (data not shown). Similar results were obtained with exosome-pulsed mature MoDCs (data not shown). Taken together, these findings suggest that similar to L. donovani infection, L. donovani exosomes have a limited capacity to promote the differentiation of naive human CD4 cells into Th1 cells through effects on MoDCs. The immunomodulatory properties of leishmania exosomes observed thus far might have been related to the effects of specific protein cargo of these vesicles to the display of surface exposed molecules or to both. To explore this, we took advantage of two mutants, HSP100−/− and LPG2−/− L. donovani (17, 19). We were particularly interested in these two strains because we had previously found both LPG2 and HSP100 to be cargo of leishmania exosomes (13). The LPG2 gene encodes a Golgi GDP-mannose transporter that is required for the synthesis of various phosphoglycans including LPG, proteophosphoglycan (PPG), and glycoinositol-phospholipids (17). As a result, LPG2 null leishmania are known to have reduced surface expression of these phosphoglycans (28–30) and would thus be expected to have reduced expression on exosomes. Moreover, LPG2−/− L. donovani show reduced infection rates both in vitro in macrophages and in vivo in murine models of infection (31), suggesting that surface phosphoglycans are important for virulence. HSP100−/− L. donovani also showed reduced virulence in vitro in macrophages, and HSP100−/− L. major was avirulent in vivo while showing no reduced viability as axenic culture forms (16, 19). These findings led us to investigate the effects of HSP100 null mutations on vesicle packaging in leishmania. When comparing WT and HSP100−/− amastigotes, we examined the composition of various cell lysate fractions, including cytosol, large vesicles such as lysosomes, phagosomes, and nuclei, and small vesicles such as endosomes, cytoplasmic microvesicles, multivesicular bodies, and their intraluminal vesicle cargo, using high-resolution two-dimensional gel analysis. We only saw major differences in the high-speed (200,000 × g) small intracellular vesicle pellets, where we found that specific HSPs—HSP90, HSP70.4, chaperonin (CPN)60.3 and CPN60.2, and TNFR-associated protein 1 (HSP75)—were apparently missing from intracellular microvesicles of HSP100−/− L. donovani (Fig. 3A). Taken together with our earlier findings showing that multiple leishmania HSPs including HSP100 were secreted via exosomes (13), our findings suggested that this crude 200,000 × g pellet contained multivesicular bodies and represented prerelease exosomes. Furthermore, these data suggested the potential involvement of HSP100 in exosome packaging of multiple HSPs and perhaps other proteins as well. We examined this hypothesis using high-throughput quantitative mass spectrometry, and indeed, the results confirmed that relative to WT exosomes, the expression of HSP90 and HSP70.4 was reduced in exosomes secreted by HSP100−/− L. donovani (Fig. 3, Supplemental Table I). WT exosomes were also significantly enriched relative to mutant vesicles in multiple validated or candidate virulence factors including GP63 (32), kinetoplast membrane protein 11 (33), and a putative homolog of iron superoxide dismutase (Fig. 3, Supplemental Table I). Conversely, exosomes from HSP100−/− L. donovani were found to be relatively enriched in histone proteins, which are considered to be exosomal markers (15). 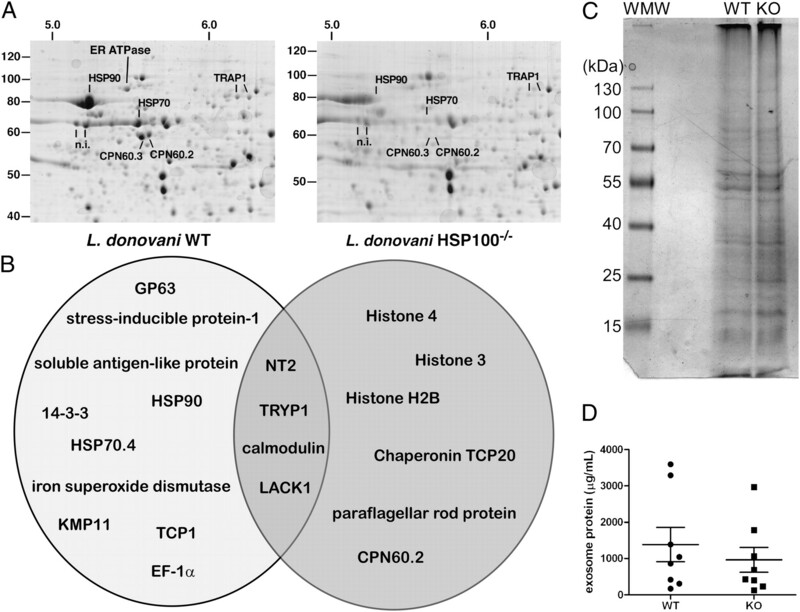 Exosomes from WT and HSP100 null L. donovani show distinct proteomic profiles. A, Amastigote cell lysates of L. donovani 1SR strain WT and HSP100−/− were subjected to serial centrifugation with a final exosome pelleting speed of 200,000 × g. Proteins in the supernatant and the pellet were precipitated after vesicle lysis and analyzed by two-dimensional gel electrophoresis. This gel is one representative of three independent experiments. Unlabeled spots were either not identified (n.i.) in the MALDI analysis, or not deemed particularly relevant. B, Exosomes harvested from WT and HSP100−/− leishmania were analyzed by quantitative mass spectrometry (see Materials and Methods). In the Venn diagram, proteins shown exclusively in either the WT or the mutant circle were enriched in that exosome population relative to the other population (see Supplemental Table I for a complete list of exosomal proteins and enrichment ratios). C, Exosomes harvested from WT and HSP100−/− leishmania have very similar protein fractionation profiles. Equal amounts (≈12 μg) of exosome protein from WT and HSP100−/− [knockout (KO)] leishmania were fractionated by SDS-PAGE and protein subsequently stained with Coomassie blue-G250. D, WT and HSP100−/− L. donovani secrete equivalent amounts of exosome-associated protein. Exosomal pellets were isolated from equal numbers of cells in equal volumes, and the protein content of the pellets was determined as described in Materials and Methods. KMP11, kinetoplast membrane protein 11; LACK1, activated protein kinase c receptor 1; n.i., not included; NT2, nucleoside transporter 1; TCP, T complex protein; TRAP1, TNFR-associated protein 1; TRYP1, tryparedoxin peroxidase 1. Further comparison of WT and HSP100−/− L. donovani exosomes showed multiple other differences in their protein cargo (Table I, Supplemental Table I), supporting the conclusion that HSP100−/− exosomes are distinct from WT exosomes. Despite these distinct proteomic profiles, the fractionation patterns of WT and HSP100−/− exosomes appeared nearly identical in reducing SDS-PAGE gels. Importantly, for HSP100−/− exosomes, there was no obvious enrichment of bands in the region of the gel (<16 kDa) corresponding to the histone protein family (Fig. 3C), which would have been predicted had the vesicles been apoptotic blebs, as opposed to exosomes (42). In addition, the vesicles released by HSP100−/− L. donovani migrated to densities between 1.16 and 1.05 g/ml in linear sucrose gradients, in a manner identical to that of canonical exosomes (data not shown). Finally there was no difference in the amount of exosomal protein released by WT or HSP100−/− L. donovani (Fig. 3D). These data indicate that the HSP100 null L. donovani secrete bona fide exosomes with distinct protein cargo. Human monocytes infected with leishmania (WT or HSP100−/−) did not produce increased amounts of either TNF-α or IL-10 when compared with unstimulated controls (Fig. 4). In contrast, although WT exosomes induced modest production of TNF-α and no IL-10, these responses were markedly enhanced by exposure of cells to HSP100−/− L. donovani exosomes. Similar results were seen when immature MoDCs were treated with WT versus HSP100−/− exosomes; treatment with HSP100−/− exosomes resulted in increased secretion of IL-6 and IL-8 compared with WT vesicle treatment (Fig. 4). Notably, treatment with HSP100−/− exosomes had no effect on IL-12p70 secretion by either monocytes or MoDCs (data not shown). Thus, knockout of HSP100 appeared to impart a gain-of-function stimulatory phenotype to leishmania exosomes. Conversely, removal of LPG and PPG from leishmania had no effects on the cytokine response of human monocytes or MoDCs to either infection or exosome treatment (data not shown). These results indicate that leishmania exosomes are capable of markedly influencing host cell cytokine production, and their specific protein composition influences the phenotype of these responses. Exosomes from HSP100−/− L. donovani induce cytokine secretion from human monocytes and MoDCs. A, Human monocytes were either untreated, treated with LPS (1 μg/ml), or infected with either WT or HSP100−/− leishmania. Parallel monocyte cultures were treated with 50 μg/ml exosomes isolated from either L. donovani 1SR strain WT and HSP100−/− (knockout [KO]). Supernatants were collected and analyzed by ELISA for TNF-α (A) after 2 h and IL-10 after 24 h. B, Immature MoDCs were treated exactly as the monocytes. Supernatants were collected after 48 h and analyzed by a combination of ELISA and the CBA Human Inflammatory Cytokine Kit for IL-6 and IL-8. The mean results from triplicate wells from three to five experiments with cells harvested from different donors are shown after normalization and log transformation. *p ≤ 0.05; ***p ≤ 0.001. In light of these findings, we examined the properties of HSP100−/− L. donovani exosomes further using the Th1 differentiation system described above. MoDCs were either infected with promastigotes of L. donovani, either WT or HSP100−/− or in parallel, MoDCs were incubated with exosomes isolated from these two strains. As shown in Fig. 5, when untreated mature MoDCs were cocultured with naive CD4 T cells, ≈22% of T cells were IFN-γ positive after 5 d. This T cell response was not significantly altered when the MoDCs had been infected with WT leishmania. In contrast, compared with control MoDCs, the signal was increased by ∼100% when MoDCs had been infected with HSP100−/− L. donovani (Fig. 5). Equally striking divergent phenotypes were observed when exosome-loaded, CD40L-matured DCs were used to drive T cell responses. As shown in Fig. 5, the T cell response was not affected by loading MoDCs with WT exosomes; however, incubation of MoDCs with HSP100−/− vesicles nearly doubled the frequency of IFN-γ–producing T cells. This change in phenotype was specific to the HSP100−/−, because it was not seen using exosomes from the LPG2−/− strain (data not shown). Furthermore, the altered functional properties of HSP100−/− exosome-treated DCs could not be explained by changes in the expression of maturation markers. Examination of surface expression of CD80, CD86, and HLA-DR on exosome-pulsed MoDCs before and after maturation showed no substantial effects of HSP100−/− exosome treatment (Fig. 6). Taken together, these findings clearly indicate that exosomes from HSP100−/− L. donovani were able to significantly upregulate the accessory cell function of mature DCs through some mechanism other than costimulatory molecule expression. 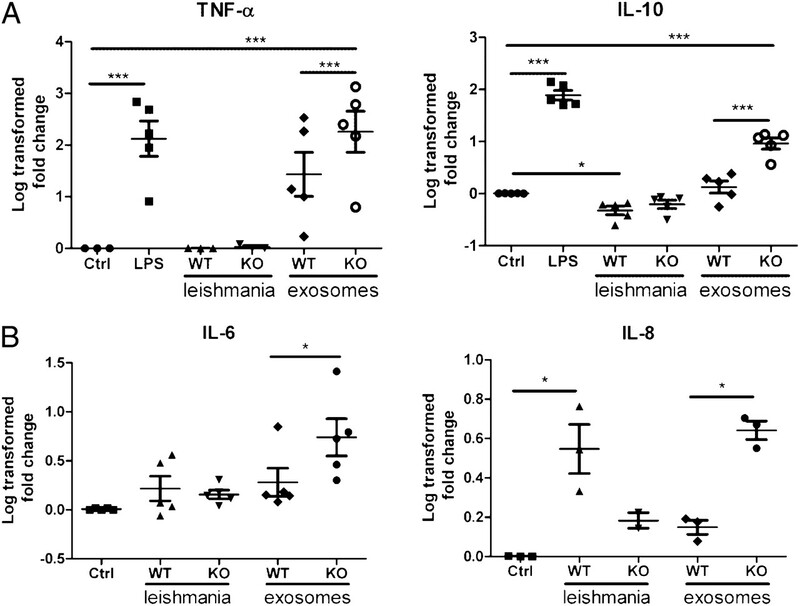 MoDCs pulsed with exosomes from HSP100−/− leishmania but not WT exosomes induce naive CD4 lymphocytes to differentiate into IFN-γ–producing T cells. MoDCs were either infected with L. donovani 1SR strain (WT or HSP100−/− [knockout (KO)]) or pulsed overnight with L. donovani 1SR strain exosomes (WT or KO). Cells were then either matured or not by transfer onto irradiated CD40L-expressing fibroblasts. Naive CD4 T cells from a different donor were isolated from PBMCs by negative selection and added to the DCs, at a ratio of 4:1, 24 h after DC maturation. After 5 d, T cells were stimulated with PMA/ionomycin/brefeldin A and then stained for FACS analysis. Cells were stained for CD4, CD11c, IL-2, and IFN-γ and analyzed with a BD FACSCanto. Whenever possible, 50,000 events were recorded. A, Plots from one experiment representative of three in which only results of matured DC-T cell cocultures are shown. B, The mean frequencies of IFN-γ–positive T cells from three independent experiments using cells from six different donors are shown along with SEs. *p ≤ 0.05. HSP100−/− exosomes do not affect costimulatory molecule expression on MoDCs. Representative CD80, CD86, and HLA-DR histograms are shown. A, Immature MoDCs were infected at a multiplicity of infection of 1:10 with WT or HSP100−/− [knockout (KO)] L. donovani 1SR. B, Immature MoDCs were treated with 50 μg/ml of either WT or HSP100−/− exosomes. C, Immature MoDCs were treated with 50 μg/ml of either WT or HSP100−/− exosomes and were subsequently matured by exposure to CD40L-expressing fibroblasts. The data shown are from one of three experiments with similar results. The in vitro findings discussed above showed that WT and HSP100−/− L. donovani exosomes exhibited distinct immunomodulatory activities. To examine the properties of these vesicles further, we investigated their behavior in in vivo animal models of disease. C57BL/6 mice are generally resistant to infection with L. donovani. They display minimal pathology and parasite loads peak 1 mo postinfection (43). As such this system is similar to subclinical human infection with L. donovani (3), and we considered it a suitable model in which to determine whether WT leishmania exosomes are in fact proparasitic. Considering the proinflammatory properties of HSP100−/− L. donovani exosomes, we also hypothesized that these mutant exosomes might protect mice against leishmania challenge. The results shown in Fig. 7A support the former of these hypotheses. Vaccination in the hind leg via s.c. injection with 15 μg WT leishmania exosomes resulted in enhanced parasite loads relative to controls, approximating an 8-fold increase. In contrast, although HSP100−/− exosomes did not protect mice against WT leishmania challenge, neither did they exacerbate disease (Fig. 7A). WT L. donovani exosomes promote parasite growth and anti-inflammatory cytokine production in vivo. Five-month-old, female C57BL/6 mice were injected s.c. in the right hind leg (four mice per group) with 15 μg L. donovani 1SR WT or HSP100−/− exosomes in 10 mM Tris/0.25 M sucrose. Three mice were treated with Tris buffer alone ,and three were untreated. After 2 wk, the mice were treated identically again, and 3 wk later, they were either challenged or not with L. donovani via the tail vein, 10 wk from the first exosome treatment. Spleens were harvested after 1 mo of infection, and single-cell suspensions were generated using cell strainers. A, Parasite loads were determined by limiting dilution assay. B, For cytokine profiling, splenocytes were plated in 96-well round bottom plates and either treated or not with 10 μg/ml SLA or 10 μg/ml mouse anti-CD3 in precoated wells. Supernatants were harvested after 48 h and analyzed as described in Materials and Methods. The data shown are from a single experiment that involved three to four mice per treatment group. Significant differences between control (untreated) and exosome-treated mice were calculated using an unpaired, two-tailed Student t test; *p ≤ 0.05. Cytokine production profiles by splenocytes in response to SLA were consistent with the parasite load data. Mice treated with WT exosomes had greater IL-10 production in response to SLA than either the control (Tris) or HSP100−/− exosome-treated mice (Fig. 7B). Moreover, both WT and HSP100−/−-treated mice had greater IFN-γ production compared with control-infected mice. Notably, enhanced IFN-γ production was coupled to increased IL-10 production only for WT exosome treatment, whereas HSP100−/− exosome treatment promoted enhanced IFN-γ release only (Fig. 7B). Of the other cytokines examined, only IL-17 production was modified by either exosome treatment and secreted to a significantly higher level by WT-treated mice specifically (Fig. 7B). TNF-α production was not modified by exosome treatment (Fig. 7B), and this was also the case for IL-6 and IL-4 (data not shown). These findings strongly suggest that WT exosomes, by promoting IL-10 production, create a proparasitic environment in the host and this property is lost with HSP100−/− exosomes. To determine whether these results suggesting a proparasitic function of WT leishmania exosomes were specific to exosomes released by L. donovani, BALB/c mice were injected s.c. with 15 μg L. major exosomes on two occasions separated by 2 wk prior to s.c. challenge with virulent L. major 3 wk later. As shown in Fig. 8, exposure of mice to exosomes markedly exacerbated disease throughout the course of infection. Five weeks postinfection, the mice were sacrificed, and their organs harvested for analysis. Notably, when compared with infected control mice, exosome-treated mice showed higher frequencies of IL-4–producing CD4 T cells in both spleen and draining lymph nodes (Fig. 8B). Moreover exosome treatment resulted in a significant reduction in the number of IFN-γ–producing CD4 T cells in these organs. Interestingly, the number of Foxp3-expressing cells in the spleen was also reduced after exosome treatment (Fig. 8), suggesting that, at least in this system, exosomes did not promote expansion of regulatory T cells. No differences between control and exosome treatment were found when we examined the expression of IL-10 and IL-12p40 mRNA transcripts in the spleen, draining lymph node, and lesion tissue (data not shown). These findings demonstrate clearly that exposure to exosomes in vivo was deleterious to the host and enhanced disease progression. L. major exosomes promote Th2 polarization and disease exacerbation in vivo. Five-week-old, female BALB/c mice were either injected s.c. in the right hind leg (five mice) or not (four mice) with 15 μg L. major exosomes. The mice were treated identically again at 7 wk and finally challenged with s.c. L. major infection at 10 wk from the first exosome treatment. A, Lesion length and width were measured weekly, and the volumes were calculated using the standard formula: volume = (length × width2)/2. **p ≤ 0.01; ***p ≤ 0.001. B, Spleens and draining lymph nodes were harvested and homogenized using cell strainers. For intracellular staining, cells were stimulated with PMA and ionomycin followed by brefeldin A. Cells were stained for CD4, IL-4, IFN-γ, and Foxp3, followed by analysis by flow cytometery. A total of 50,000 events, gated on CD4+ cells, were collected. The percent change in cytokine-expressing cells in organs from exosome-treated mice as compared with organs from non–exosome-treated mice was calculated by dividing the number of positive cells from the former by the number of cells from the latter and multiplying by 100. Statistical significance was determined using a percent change threshold, wherein values greater that the coefficient of variance (SD divided by the mean) were considered significant. This is indicated by an asterisk. We have recently proposed a model in which leishmania exosomes interact with and functionally prime naive host cells for infection (13). These vesicles might be released from either recently inoculated promastigotes (and in fact may be part of the inoculum, having been secreted by metacyclic leishmania in the sandfly salivary gland), by free amastigotes after cell rupture, or both. Indeed, the findings reported above substantiate such a model and provide evidence that multiple signals, including exosomes, combine to regulate cytokine production in response to leishmania. Thus, we found that exposure of human monocytes to exosomes from L. donovani altered monocyte cytokine responses to leishmania infection and IFN-γ treatment (Fig. 1). These perturbations were anti-inflammatory in nature as reflected by inhibition of IL-8 and TNF-α production combined with augmented production of IL-10. Given that IL-10 is recognized to be a potent anti-inflammatory cytokine involved in mediating immune suppression during leishmania infection (44–46), enhanced production of IL-10 as a result of exposure to exosomes suggests a potential role for these vesicles in pathogenesis. Much like our findings with monocytes, we observed that leishmania exosomes were predominantly inhibitory with respect to cytokine production by MoDCs (Fig. 2B). However, inhibition of cytokine production by MoDCs required rather high concentrations of exosomes. This was in comparison with inhibition of MoDC cell surface marker expression (Fig. 2A) or the results with IFN-γ–treated, infected monocytes (Fig. 1) which showed modulated phenotypes after treatment with low doses (2 μg/ml) of vesicles. Our previous estimations of exosome release per cell (based on exosomal protein) suggest that a single L. donovani cell, cultured at 37°C releases 30 ng exosomal protein in 24 h (13). Recently it was demonstrated that a sand fly is capable of delivering between 600 and 100,000 leishmania during a blood meal (47). Thus, we can hypothesize that in the first 24 h postinfection, at a minimum, ∼17 μg leishmania exosomes may be released by 600 parasites deposited in the dermis. As such, we consider results with exosome concentrations of ≤50 μg/ml to have potential physiological relevance, and this is a conservative estimate. Within this physiologically relevant range, exosomes from WT leishmania were ineffective at priming MoDCs to drive the differentiation of naive CD4 T cells into IFN-γ–producing Th1 cells (Fig. 5). Of special interest, was the finding that in comparison with WT exosomes, vesicles from HSP100 null L. donovani showed an opposing phenotype that was largely proinflammatory (Fig. 4) with the capacity to drive naive CD4 lymphocytes to differentiate into Th1 cells (Fig. 5). These findings, combined with the distinct proteomic signatures of the two vesicle populations, suggest that the properties of these vesicles are influenced by the specificities of cargo packaging regulated or aided by HSP100. It is also worth highlighting that immunosuppressive properties were not unique to L. donovani exosomes. Thus, we also observed that exosomes from L. major promoted Th2 cell polarization in vivo and caused exacerbation of leishmania infection (Fig. 8). With respect to the role of exosomes in the biology of leishmania infection, at least two important questions emerged from these findings: 1) what are the mechanisms involved in exosome production, release and packaging, and 2) how do these vesicles bring about changes in monocytes and MoDCs. Regarding the first question, traditional genetic approaches appeared unsuitable to study mechanisms of leishmania vesicle trafficking. This was related to the fact that mutations to vesicle trafficking machinery in leishmania specifically, and kinetoplastids in general, result in either severe growth defects or lethality (34, 48, 49). In light of this, we focused on the importance of exosomal packaging and quantitative proteomic data suggested that leishmania HSP100 is likely involved in regulating the packaging of specific proteins (Fig. 3). Additional study and improved approaches will be required to identify other proteins involved in exosome packaging and to fully elucidate the cellular mechanisms governing leishmania exosome production and release. Regarding the second question, based on our results we suggest that exosomes deliver virulence factors such as EF-1α, GP63 and others to host cells that interfere with host cell signaling, leading to immune modulation. This is addressed further below. Previous work from this laboratory showed that leishmania infection attenuated IFN-γ–induced macrophage activation through disruption of the IFN-γR signal transduction pathway (9, 35). In fact, we found exosomes to contain at least one of the leishmania proteins responsible for this effect—EF-1α (13). The results in Fig. 1 show that exposure of cells to exosomes prior to infection altered subsequent responses to IFN-γ with inhibition of IL-8 and TNF-α production while conversely boosting that of IL-10. Likewise, our findings suggest that exosomes are the likely mechanism by which GP63 is delivered to infected cells (13), wherein it has been shown to interfere with p38-MAPK signaling and macrophage activation (6). These findings add support to a model in which leishmania exosomes deliver virulence factors to host cells which disrupt host cell signaling pathways necessary to control infection. Further support for this model comes from our in vivo investigation of the immunomodulatory properties of leishmania exosomes, using mouse models of infection. Exposure of C57BL/6 mice to WT L. donovani exosomes resulted in higher parasite loads in the spleen after subsequent infection (Fig. 7A) and a cytokine profile (Fig. 7B) suggestive of an immune response dominated by suppressor T cells producing both IL-10 and IFN-γ. Th1 cells dually producing IL-10 and IFN-γ have recently been shown to be the dominant suppressor cell in leishmania infections (36, 37), and high IFN-γ production has recently been linked to generation of suppressor cell types (38). Moreover, our results suggest that the proparasitic properties of WT exosomes are not species specific. Thus, similar to the results for L. donovani exosomes, exposure of BALB/c mice to exosomes prior to infection exacerbated disease progression, and this appeared to involve promotion of Th2 polarization (Fig. 8). These findings indicate that leishmania exosomes are capable of biasing the immune response to make it permissive for infection, perhaps through their generally inhibitory effects on monocytes as well as MoDCs. Ongoing work is focused on identifying the proteins, both host and pathogen, responsible for the immunomodulatory properties of leishmania exosomes. In addition to effects on TNF-α, IL-8, and IL-10, the influence of exosomes on IL-12 production was of considerable interest because of its critical role in resistance to leishmania infection. We were unable, however, to detect IL-12p70 in supernatants of human monocytes, even after LPS stimulation. This was not entirely surprising because the literature indicates that IL-12p70 production by monocytes is not a consistent finding (37, 39, 40). In contrast, it is well known that DCs are principal sources of IL-12p70, and we found up to 50% inhibition of IL-12p70 production by MoDCs after leishmania exosome treatment (Fig. 2). In addition to inhibition of IL-12p70, we found exosome dose-dependent inhibition of TNF-α and IL-10 from both immature and CD40L-matured MoDCs (Fig. 2). This general inhibition of both pro- and anti-inflammatory cytokine production by DCs suggests that exosomes mediate some broadly inhibitory mechanism yet to be elucidated. Nevertheless, exosome-mediated inhibition of proinflammatory cytokine production by both MoDCs and leishmania-infected, IFN-γ–treated monocytes suggests that these vesicles are predominantly immunosuppressive. To address how leishmania exosomes may influence the development of acquired immune responses, we examined their influence on MoDC-dependent differentiation of naive CD4 cells into Th1 cells. Both leishmania-infected MoDCs and exosome-pulsed MoDCs showed little to no capacity to support the differentiation of naive CD4 lymphocytes into IFN-γ–producing Th1 cells (Fig. 5). To determine whether this null phenotype was an intrinsic property of leishmania exosomes, we took advantage of mutant strains of leishmania lacking either HSP100 or LPG2. The rationale for examining HSP100 null leishmania in this context was based on the knowledge that they release exosomes with distinctly altered protein cargo (Fig. 3). In contrast, we elected to use LPG2 null leishmania because they are defective in expression of the major surface molecules LPG and PPG and would be expected to secrete exosomes lacking these. Although we did not examine directly the expression of LPG by WT exosomes, several lines of evidence suggest that LPG expression on exosomes is likely: 1) we found that leishmania exosomes contain a large number of known leishmania surface proteins, both transmembrane and, like LPG, GPI-linked (13); 2) we also found that leishmania exosomes contain LPG2 (13), which is required for cell surface expression of LPG by L. donovani (31); and 3) leishmania exosomes appeared to be predominantly immunosuppressive, a known property of LPG (29, 31). When MoDCs were pulsed with HSP100−/− exosomes, these cells induced a ∼100% increase in the number of IFN-γ–producing T cells (Fig. 5). In contrast, treatment of MoDCs with WT exosomes generated a negligible signal in this assay (Fig. 5), as was the case for exosomes from LPG-deficient leishmania (data not shown). These results indicate that although WT exosomes per se did not enhance IFN-γ production by CD4 T cells, this phenotype reflected the specific protein composition of the exosomes rather than an intrinsic inability to do so. In fact, quantitative mass spectrometry showed that exosomal protein packaging by HSP100 null leishmania was quite distinct from that of WT exosomes (Fig. 3, Table I). It is highly likely that this altered exosome composition accounted for the ability of the HSP100−/− exosomes to potentiate IFN-γ production by CD4 T cells in response to MoDCs, in contrast to their WT counterparts. To address how exosomes bring about changes in monocytes and MoDCs, we again took advantage of vesicles harvested from LPG2−/− and HSP100−/− L. donovani. Notably, in contrast to WT exosomes, HSP100−/− exosomes were markedly stimulatory for cytokine production (Fig. 4), whereas LPG2−/− vesicles behaved liked their WT counterparts (data not shown). These findings suggest that the null or inhibitory phenotypes of WT exosomes are related to the specific protein composition of these vesicles. This likely reflects the presence of inhibitory cargo, the packaging of which is dependent on HSP100. The potential contribution of HSP100 to virulence is also supported by our previous observations that HSP100−/− leishmania showed incomplete amastigote differentiation, were unable to survive and replicate within cultured macrophages, and were avirulent in mice (16, 19, 49) as well. It is thus clear that HSP100 mediates some essential function, without which a mature antileishmanial Th1 response effectively clears the infection. Even spontaneous escape variants of HSP100 null L. donovani, while showing restored virulence, induced a markedly enhanced IFN-γ response in infected mice (50), underscoring the potential importance of HSP100-mediated vesicle packaging for inhibition of Th1 polarization. On the basis of our observations, we propose that the function of HSP100 involves at least the regulation of protein packaging into exosomes and that this cargo influences the impact of the vesicles on host myeloid cells. However, a full lipidomic analysis of these vesicles will be required to fully appreciate the molecules responsible for conferring altered phenotype. To date there are no standardized leishmania vaccines that have passed regulatory review and been brought to the clinic. One of the main barriers to leishmania vaccine development has been the lack of safe Th1 adjuvants (51). Lipid adjuvants have been attracting attention, and it was recently shown that encapsulating leishmania Ags in liposomes generated greater protective immunity against VL when compared with the use of soluble Ag only (21). Given that leishmania exosomes are de facto liposomes encapsulating leishmania Ags, it was reasonable to predict that they might be immunogenic and induce protective immunity. Paradoxically, rather than inducing protection, we observed that WT leishmania exosomes caused disease exacerbation (Figs. 7, 8). However, the contrasting phenotypes of WT and HSP100−/− L. donovani exosomes, in particular the ability of the latter to promote Th1 differentiation (Fig. 5) without promoting IL-10 or exacerbating disease (Fig. 7) in a resistant mouse model, suggest that there may be value in investigating the vaccine potential of vesicles from HSP100 null leishmania. In conclusion, through the study of exosomes, immunologists and cell biologists have discovered, or in a sense rediscovered, a previously underappreciated organelle. It has been firmly established that these vesicles serve as a means of communication, over both short and long distances, between cells of mammalian immune systems to enhance or dampen cellular responses as needed. The findings in this report now establish that leishmania exosomes are immunomodulatory with predominantly anti-inflammatory effects that promote disease progression. Furthermore, until now the role of exosome protein cargo in determining the phenotype of these vesicles has been unexplored. The results presented above show clearly that exosomal protein cargo plays a significant role in influencing the phenotype of leishmania exosomes and suggest the possibility that the same may be true of exosomes in general. In conclusion, our results suggest that the secretion of exosomes by leishmania likely plays a major role in the pathogenesis of these organisms and lead us to speculate that exosomes may be a mechanism of immune modulation used more generally by intracellular and extracellular eukaryotic pathogens. We thank Dr. Devki Nandan for helpful discussions and technical advice and Dr. Stephen Beverley for providing LPG mutants. We thank the support of the Cell Separator Unit at Vancouver General Hospital for providing PBMCs. This work was supported by Canadian Institutes of Health Research Grants MOP-84582 (to N.E.R. ), MOP-77688 (to L.J.F. ), MOP-7399 (to W.R.M. ), and MOP-57834 (to M.K.L.) and by a Small Projects Health Research grant from the BC Proteomics Network (to N.E.R.). Mass spectrometry infrastructure used in this project was supported by the Canada Foundation for Innovation, the British Columbia Knowledge Development Fund, and the Michael Smith Foundation through the BC Proteomics Network. L.J.F. is the Canada Research Chair in Quantitative Proteomics and a Michael Smith Foundation Scholar. Core support for flow cytometry was funded by the Michael Smith Foundation for Health Research Immunity and Infection Research Center Unit. M.K.L. is a Canada Research Chair in Transplantation and a Michael Smith Foundation for Health Research Scholar.
. 2007. Visceral leishmaniasis: what are the needs for diagnosis, treatment and control? Nat. Rev. Microbiol. 5: 873–882.
. 2005. The current status of zoonotic leishmaniases and approaches to disease control. Int. J. Parasitol. 35: 1169–1180.
. 2005. Immunopathogenesis of infection with the visceralizing Leishmania species. Microb. Pathog. 38: 147–160.
. 2002. Targeted gene deletion in Leishmania major identifies leishmanolysin (GP63) as a virulence factor. Mol. Biochem. Parasitol. 120: 33–40.
. 1995. Role of the Leishmania surface protease gp63 in complement fixation, cell adhesion, and resistance to complement-mediated lysis. J. Immunol. 155: 3102–3111.
. 2009. The Leishmania surface protease GP63 cleaves multiple intracellular proteins and actively participates in p38 mitogen-activated protein kinase inactivation. J. Biol. Chem. 284: 6893–6908.
. 2002. Functional analysis of cathepsin B-like cysteine proteases from Leishmania donovani complex: evidence for the activation of latent transforming growth factor β. J. Biol. Chem. 277: 25305–25312.
. 2003. Activation of TGF-β by Leishmania chagasi: importance for parasite survival in macrophages. J. Immunol. 170: 2613–2620.
. 2002. Leishmania EF-1α activates the Src homology 2 domain containing tyrosine phosphatase SHP-1 leading to macrophage deactivation. J. Biol. Chem. 277: 50190–50197.
. 2004. Immune response to Leishmania infection. Indian J. Med. Res. 119: 238–258.
. 2007. Leishmania major abrogates γ interferon-induced gene expression in human macrophages from a global perspective. Infect. Immun. 75: 3506–3515. 2005. Targeting cell regulation promotes pathogen survival in macrophages. Clin. Immunol. 114: 213–215.
. 2010. An exosome-based secretion pathway is responsible for protein export from Leishmania and communication with macrophages. J. Cell Sci. 123: 842–852.
. 2008. Proteomic profiling of exosomes: current perspectives. Proteomics 8: 4083–4099.
. 1999. A novel role for 100 kD heat shock proteins in the parasite Leishmania donovani. Cell Stress Chaperones 4: 191–198.
. 1997. Golgi GDP-mannose uptake requires Leishmania LPG2: a member of a eukaryotic family of putative nucleotide-sugar transporters. J. Biol. Chem. 272: 3799–3805.
. 2008. Proteomic analysis of the secretome of Leishmania donovani. Genome Biol. 9: R35.
. 1998. Leishmania donovani heat shock protein 100: characterization and function in amastigote stage differentiation. J. Biol. Chem. 273: 6488–6494.
. 2001. Human cd25+cd4+ T regulatory cells suppress naive and memory T cell proliferation and can be expanded in vitro without loss of function. J. Exp. Med. 193: 1295–1302.
. 2007. Leishmanial antigens in liposomes promote protective immunity and provide immunotherapy against visceral leishmaniasis via polarized Th1 response. Vaccine 25: 6544–6556.
. 2009. Identification of regulatory T cells during experimental Leishmania infantum infection. Immunobiology 214: 101–111.
. 2009. Vector transmission of leishmania abrogates vaccine-induced protective immunity. PLoS Pathog. 5: e1000484.
. 2003. Developmentally induced changes of the proteome in the protozoan parasite Leishmania donovani. Proteomics 3: 1811–1829.
. 2006. Quantitative comparison of caste differences in honeybee hemolymph. Mol. Cell. Proteomics 5: 2252–2262.
. 2008. Changes in protein expression during honey bee larval development. Genome Biol. 9: R156.
. 2007. Monocyte-derived dendritic cells formed at the infection site control the induction of protective T helper 1 responses against Leishmania. Immunity 26: 519–531.
. 2003. An in vitro system for developmental and genetic studies of Leishmania donovani phosphoglycans. Mol. Biochem. Parasitol. 130: 31–42.
. 2003. The role(s) of lipophosphoglycan (LPG) in the establishment of Leishmania major infections in mammalian hosts. Proc. Natl. Acad. Sci. USA 100: 9536–9541.
. 2002. Leishmania LPG3 encodes a GRP94 homolog required for phosphoglycan synthesis implicated in parasite virulence but not viability. EMBO J. 21: 4458–4469.
. 2009. Leishmania donovani lacking the Golgi GDP-Man transporter LPG2 exhibit attenuated virulence in mammalian hosts. Exp. Parasitol. 122: 182–191.
. 2003. The major surface protease (MSP or GP63) of Leishmania sp. biosynthesis, regulation of expression, and function. Mol. Biochem. Parasitol. 132: 1–16.
. 2005. Effect of LACK and KMP11 on IFN-γ production by peripheral blood mononuclear cells from cutaneous and mucosal leishmaniasis patients. Scand. J. Immunol. 61: 337–342.
. 2002. Secretory pathway of trypanosomatid parasites. Microbiol. Mol. Biol. Rev. 66: 122–154.
. 2005. Leishmania donovani engages in regulatory interference by targeting macrophage protein tyrosine phosphatase SHP-1. Clin. Immunol. 114: 266–277.
. 2007. Splenic accumulation of IL-10 mRNA in T cells distinct from CD4+CD25+ (Foxp3) regulatory T cells in human visceral leishmaniasis. J. Exp. Med. 204: 805–817.
. 2007. CD4+CD25–Foxp3– Th1 cells are the source of IL-10-mediated immune suppression in chronic cutaneous leishmaniasis. J. Exp. Med. 204: 285–297.
. 2009. IFN-γ, as secreted during an alloresponse, induces differentiation of monocytes into tolerogenic dendritic cells, resulting in FoxP3+ regulatory T cell promotion. J. Immunol. 183: 2932–2945.
. 2009. KMP-11 DNA immunization significantly protects against L. donovani infection but requires exogenous IL-12 as an adjuvant for comparable protection against L. major. Vaccine 27: 1306–1316.
. 1999. Murine dendritic cells internalize Leishmania major promastigotes, produce IL-12 p40 and stimulate primary T cell proliferation in vitro. Eur. J. Immunol. 29: 1803–1811.
. 1997. Leishmania major Hsp100 is required chiefly in the mammalian stage of the parasite. Mol. Cell. Biol. 17: 5987–5995.
. 2001. Proteomic analysis of dendritic cell-derived exosomes: a secreted subcellular compartment distinct from apoptotic vesicles. J. Immunol. 166: 7309–7318.
. 2000. IL-12 gene-deficient C57BL/6 mice are susceptible to Leishmania donovani but have diminished hepatic immunopathology. Eur. J. Immunol. 30: 834–839.
. 2009. IL-27 regulates IL-10 and IL-17 from CD4+ cells in nonhealing Leishmania major infection. J. Immunol. 183: 4619–4627.
. 2008. Leishmania donovani infection down-regulates TLR2-stimulated IL-12p40 and activates IL-10 in cells of macrophage/monocytic lineage by modulating MAPK pathways through a contact-dependent mechanism. Clin. Exp. Immunol. 154: 224–234.
. 2002. Interleukin-10 (IL-10) in experimental visceral leishmaniasis and IL-10 receptor blockade as immunotherapy. Infect. Immun. 70: 6284–6293.
. 2008. Quantification of the infectious dose of Leishmania major transmitted to the skin by single sand flies. Proc. Natl. Acad. Sci. USA 105: 10125–10130.
. 2006. Endosome sorting and autophagy are essential for differentiation and virulence of Leishmania major. J. Biol. Chem. 281: 11384–11396.
. 1995. Protein trafficking in kinetoplastid protozoa. Microbiol. Rev. 59: 325–344.
. 2006. Spontaneous recovery of pathogenicity by Leishmania major hsp100–/– alters the immune response in mice. Infect. Immun. 74: 6027–6036.
. 2005. Second-generation vaccines against leishmaniasis. Trends Parasitol. 21: 244–249.